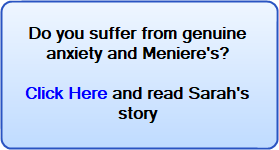 Can stress cause Meniere's disease? Meniere's Disease and Stress seem to go hand in hand but is stress an underlying cause of Meniere's, is your stress a result of having to live with such a debilitating and depressing condition, or is stress a contributing trigger? Well, possibly all three, as it can become a vicious circle. Prolonged periods of stress can cause the blood vessels to close up, slowing up blood flow and subsequently contributing to worsening the condition of the affected ear(s). If that is not enough, the levels of stress living with Meniere's Syndrome or Meniere's Disease, whatever you choose to call it, puts strain both physically and mentally on sufferers at levels beyond the comprehension of the vast majority of people who have never experienced it. There is little doubt that stress is a massive trigger. So-called "life-stress situations" which commonly precede attacks include personal antagonism and conflicts, sexual conflicts, death of a close relative, social, educational or financial problems, common day to day stresses, work stress, and of course fear of future attacks. Clinical trials at Osaka University, Japan have been ongoing since 1998, related to stress management and Meniere�s disease; the most recent in 2013. These trials have shown a correlation of significantly increased plasma vasopressin in Meniere's patients and that this increase can rupture the reissners membrane within the endolymphatic sac. The researchers are in no doubt that there is an increase of vasopressin, but are trying to find the exact stress events that may cause this to occur. One important aspect of this is that, while some in the west dismiss stress as a factor the researchers in Osaka had this to say, �Attacks in Meniere�s disease, characterized by vertigo and hearing loss, are well known to occur repeatedly under stressed environment. Hitherto, its pathology was revealed to be inner ear hydrops through human temporal bone studies in 1938? With many triggers, there is a gray area as to whether they are contributing triggers that increase pressure, tinnitus, dizzines and vertigo when a sufferer already has the condition or are they the underlying root cause. In Japan stress is almost a given that it is one of many possible underlying causes to be considered. The stress is making your Meniere's worse and Meniere's is making you more stressed! So what on earth can you do about it? More often than not for people with Meniere's, severe bouts of vertigo come suddenly and unexpected. Sometimes though, you'll feel it coming: You start to feel clammy. A sudden fever will grip you, coupled with nausea and a sudden exhaustion. You panic, knowing full well what will follow, which more often than not, is a full blown vertigo attack. That panic (stress) helps speed up the oncoming bout of vertigo. The vasopressin realeased is a hormone that constricts the blood vessels (restricting blood flow -which is vital), retains fluid which is building up in the endolymphatic sac, and may also increase salt into the blood. All in all a very bad set of circumstrances for a Meniere's sufferer. So the very fast end result is that before you know it you are reeling with dizziness or vertigo. Most of the time it seems unavoidable. But, have you ever, (situation permitting) as soon as you feel that clammy feeling and the feeling of panic, just closed your eyes sat back, kept your eyes closed and taken some deep breaths until the feeling passes. This can actually sometimes work, either with limiting the dizziness to a milder bout that passes more quickly or on occasions even keep the dreaded attack completely at bay. Being stationary, sitting and keeping your eyes closed is essential to this having any chance of working. Stay still and stay calm. To people with Meniere's who have never done this, it may sound an impossible task, and quite honestly with those sudden vertigo attacks it may be. But on the occasions where it creeps up on you (relatively speaking)...this can be done. Is it possible to calm yourself in the face of the panic attack that occurs minutes, or sometimes seconds prior to a vertigo attack? In the right situation, 'possibly' yes. There is a program that is well worth checking. It was designed for people who suffer from genuine panic attacks and general anxiety. While generally speaking you may or may not fall neatly into that category, we do all know that feeling of panic just before a major attack and the acute anxiety at that particular time has to speed up the chances of a full blown vertigo onslaught. The stress and anxiety many of us feel daily, sometimes extreme, is contributing to our condition. 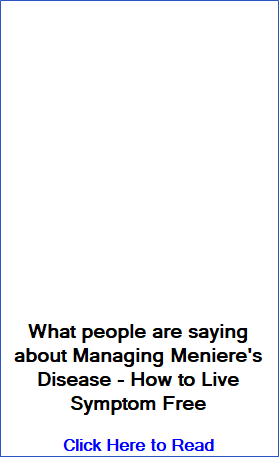 We have received emails from people with Meniere's who claim to have used this program with very good results. It has to be said that most of those mails were from sufferers who considered themselves to be sufferers of genuine anxiety anyway. Never the less, they all had very good things to say about it. A natural self help program like this, that reportedly has such good results quickly, has to be better than spending money, month after month on valium or other tranquilizer drugs that the doctors prescribe. There are good reasons why the doctors may prescribe such medicines, but they can leave Meniere's sufferers, who already stumble through daily life with brain fog and the like, feeling like Zombies. If you are interested in trying this stress/panic/anxiety relief program Click Here to read about it in more detail. It is very simple and very effective. If you do decide to use this program or you have already used it, we would love to hear from you so we can advise people better. If it works for you, please let us know and even more so if it doesn't work for you let us know. 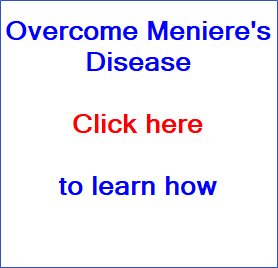 We want to be in the best position to give accurate, useful advice that can positively benefit the Meniere's sufferers who visit Menieres-Help.Com. So far we have had no negative reports. The name of this simple program is "Panic Away" and you can read and watch a video about the simple techniques here. Have you ever considered meditation? In 12 years of support work we have increasingly received very good reports of the benefits of this for sufferers. At the very least, it must be worth remembering that no amount of avoidable stress is worth bringing on vertigo. When you feel your stress levels rising, stop, step back, take a deep breath and walk away. What ever you choose to do to combat stress and Meniere's it is important you do something positive. In general day to day living, try and surround yourself with positive people who make you smile and if you are stressed at work, or with the kids, just take a step back, take a deep breath and remid yourself that none of what you are stressed about is worth bringing on a vertigo attack. So chill out and get your priorities right; your health may just depend on it. Finally remember that simply the best solution is to rid yourself of Meniere's for good and get out of the stress/vertigo cycle. Learn how to do that here.